11 years. 250,000 moves. 100,000 reviews. 1 awesome new look. Introducing the new HireAHelper logo. HireAHelper has spent the last decade making moving anywhere in the country simple and affordable. Now we’re bringing that fresh “just moved” feeling straight to our website. Our brand new “H-logo” and green colors mark a moving adventure we can call our very own. In other words, we just turned over a bright, green leaf. Is anything else new? 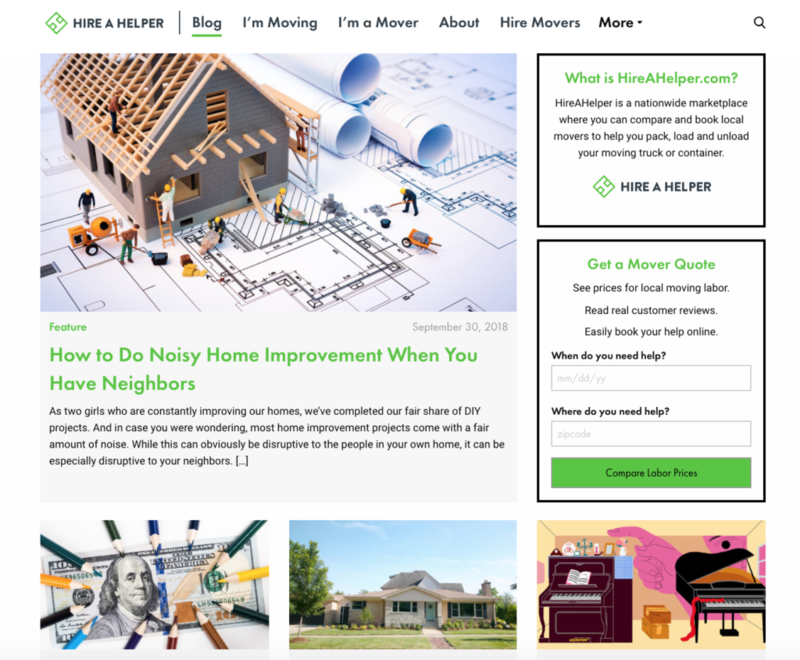 Don’t worry, whether you’re moving or you’re a mover yourself, everything you love about HireAHelper is still here. We’re a nationwide marketplace of local movers that’s easier than ever to browse, with live help available 7 days a week. But more great additions are on the horizon. We’ve pioneered Hybrid™ Moving, and now we’re giving you even more options than ever before. Coming soon to select cities, we’re giving you the option to search our local mover marketplace for Full Service movers. This is a huge expansion to our moving options that will take even more stress out of your move. Stay tuned to this site for more details. Moving soon? Want to join hundreds of local movers from across the country already in the marketplace? Come see for yourself why over 100,000 people have given their HireAHelper moves an average 4.7 out of 5 stars. How Do I Plan a Long Distance Move? Moving long distance requires patience, stamina, and grit. But it doesn’t have to be an awful experience. With some planning, a little know-how, plus some research, you can make the process of moving much easier. But just to help you out, we went ahead and did all the research for you. After all, settling into a new, far-away land shouldn’t be anything less than transformational! How Am I Gonna Get Me and My Stuff Where I’m Going? If you need to get repairs ahead of time, then trust us, do that first. If that seems like it could be an issue or you just don’t wanna add hundreds of miles to your car, consider getting your car shipped. Your other options are hitching it (to a truck for towing) or just ditching it. You can always try selling it or trading it in if you decide this is the end of the road for the car. Are you driving with small children? Transporting pets? Both of those have special considerations, so click those links to learn everything you should know first. The most hands-off option for getting you and everything long distance is a Full Service moving company. If you have the money for going that route, you need to find one with proper licensing, especially for interstate moves, as opposed to somebody off Craigslist. What other options are there? 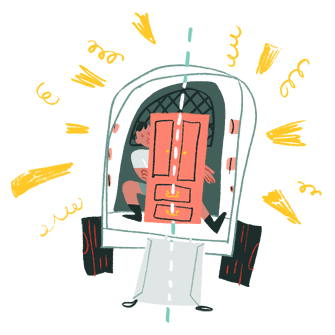 Some people who make a long distance move opt to rent a moving truck for loading up their stuff and driving it themselves, then only hire movers for the lifting part, not the driving. This is called Hybrid Moving and can save a lot of money (if you don’t mind the drive). If you want to leave the driving to somebody else but still want to save money as compared to a Full Service Move, you can opt for portable moving containers like a PODS container. With those, professionals drive your stuff to and from destinations. A final option to explore is to rent space in a freight truck that a professional driver hauls to your final destination, or sometimes to a warehouse for pick up. The pros, cons, and prices of all of these options (and much more) are covered extensively on Moving101. How much experience do you have serving clients moving long distance? How does that compare with the number of local moves you conduct for clients? Do you have proper, up-to-date licenses? Are you legally able to work in both states and cross state lines? What kind of feedback do you get from clients? How would you describe the value you provide for the price you charge? What are your policies regarding damaged or lost goods? What are your policies regarding re-scheduling or canceling service? And you shouldn’t just take their word for it either. Get genuine opinions by consulting verified reviews on HireAHelper or anywhere you look. If you’re taking a plane to the final destination, you should obviously consider bringing some things with you in luggage or handbags to save money on however you’re moving the rest of your stuff. Pack clothes and personal items that won’t break in the luggage, and bring fragile stuff, such as laptops and digital devices, in your carry-on bag. Paying for extra luggage on a flight is sometimes cheaper than shipping it via snail mail! 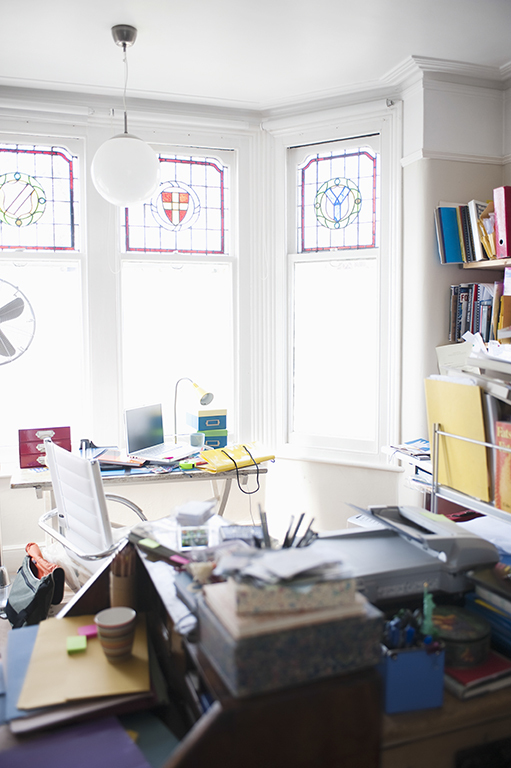 Pile up your stuff, do the calculations and see what works best with your budget. Looking to maximize your flying budget? In “The 10 Best (and Worst) Airfare Search Sites,” Frommer’s shares some of the best places for you to seek hot deals for air travel. 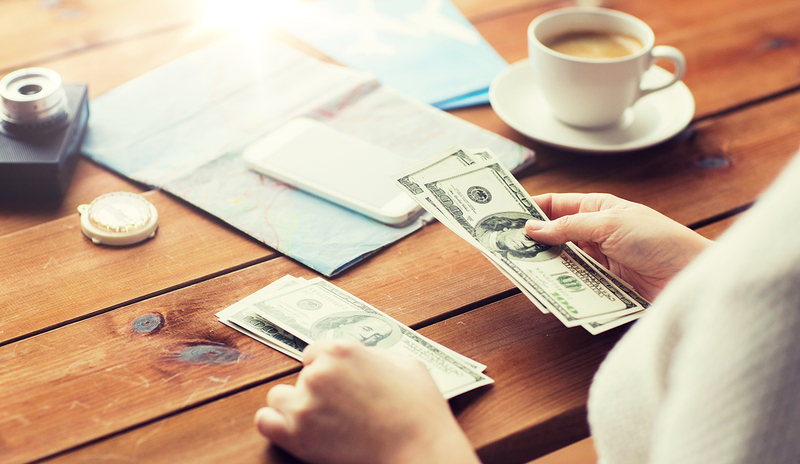 When researching prices for flights, consider the following online travel agents and booking sites, but recognize that being better known does not necessarily mean being the best. Should I ship my stuff? Of course, you probably have more than a few pounds worth of stuff. In this case, moving containers are a savvy pick for getting your stuff driven to where it needs to go for you. Not only do shipping containers come in different shapes and sizes, but you can plan to keep them placed somewhere for usually as much as a month at a time, so there’s lots of flexibility with using a moving container for a long distance move. Do you care if it’s wooden versus metal? How long do you need it to wait for you before unloading it? Do you need help loading and unloading it? Your options will depend on where you live, due to which moving container companies are available to you. 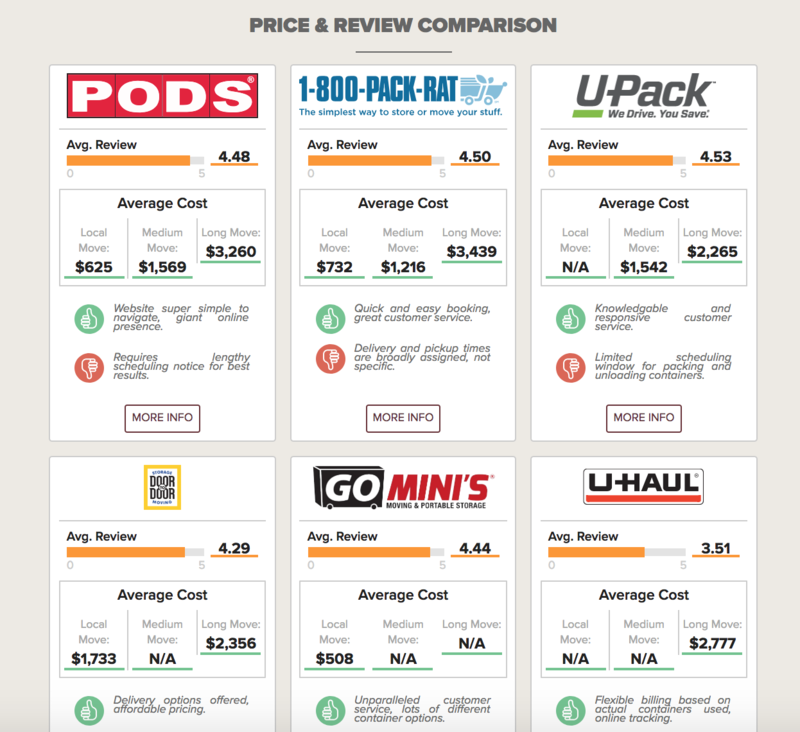 Beyond PODS containers, check out this massive break down of the best moving container companies for your exact situation. How Much Do Long-Distance Moves Cost? Long distance and interstate moving companies charge based on weight, distance, and any extra equipment or insurance options you opt into. The average cost of an interstate move is $4,300 for an average distance of 1,225 miles and a shipment weight of 7,400 pounds, according to the American Moving and Storage Association and as reported by numerous outlets. One more big factor to consider is if you have any specialty items to move, such as a baby grand piano or gun safe. Are there any ways to reduce the price? What if I’m Moving Across State Lines? Doing your homework on what is required of you for your specific interstate move is the first step. Interstate moves are particularly complicated due to state laws. You have to know what you are responsible for when you cross into another state. Also, some states have certain laws restricting what you can bring in. For instance, there are a number of items that are illegal to bring into California, including certain firearms and fruits. Yes, your pet ferret, among other things, can’t join you if you’re headed for the Golden State. How Do I Pack My Stuff? Anyone who has ever moved can tell you that packing up your entire world is maybe the most stressful part of the journey. Getting sturdy cardboard boxes and wisely packing them is one way to ensure the process is easier. Refraining from making any of the boxes too heavy and keeping items that will go in the same room in one box are obvious tips. If you want to be extra cautious with your stuff, then turn to professionals for help with packing your things. Should I get rid of my stuff? Take a look over the vast empire you’ve established. You must recognize that the less stuff you have to move, the better off you’ll be. After all, professional moving companies generally charge you based on the weight of the stuff you need to be transported. In other words, both literally and figuratively, you will have lifted a weight off your shoulders if you downsize. Experts suggest taking photographs, especially for anything of great value. You may want proof of exactly what condition the chosen ones – items with which you simply can’t part – were in before they get on the moving truck (or whatever mode of transportation you choose). Moving long distance is a tremendous undertaking. But if you prepare and research your options, you can make the move successfully without pulling out your hair. As you deal with the technical aspects of the move, give yourself a break if you – or others in the family – get emotional. Starting a new life in a new place is never easy. A stress-free move is the first step to arriving at this new world. Every year, a large number of people moving to a new state ship their cars for the first time. 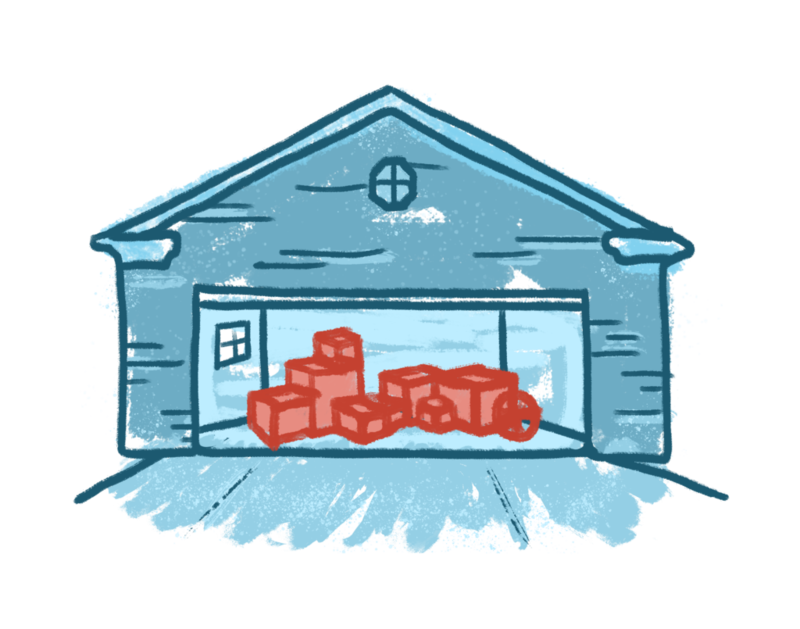 Shipping a car isn’t hard, but a few common mistakes can cost you a lot of time and money, especially when trying to juggle the logistics of moving your house too. So I’m using my decade of expertise to help. Here’s how to (safely) do an auto transport using a step-by-step process. If you reside in a big city, these days it’s as simple as typing “my city auto transport” into Google. The “my city” being either the city you are shipping to or from. Literally hiring a company online to move your car is usually the easiest part of the entire auto transport process. It’s cheaper than hiring a professional driver, keeps miles off your tires, and it’s helpful if you aren’t able to drive the car to your new place yourself. Does the company have to be located where I’m going or where I am now? No. Finding a company based in either your origin or destination city isn’t crucial. You can absolutely hire a company from anywhere in the country to ship your car. But companies based on where you are or are going are ideal because of the flexibility they might offer with scheduling. The shippers will be in your city of origin or destination for a few days, as opposed to passing through, which usually leads to more flexibility. What if there is no auto-transport company near me? Unfortunately, finding an auto transport company specific to your city isn’t always possible, especially if you live in a rural area. If you live where there are few options near you, your first step is to search for a company based in the opposite place that you are shipping your car either to or from. Every state typically has at least a few auto transport companies that can help. If you still can’t find one (or you don’t like any of the ones that you do find), move on to just a general search for auto transport companies elsewhere in the country. Yes, you can still receive fine service from a company not based in your state, it’s just an advantage to have someone familiar with your route to work for you. I always recommend calling them, as opposed to emailing, because you get a much better feel for what working with that company will be like. How much does it cost to transport my car? This will vary significantly based on lots of factors, but transportreviews.com reports that the average cost is $983, based on the average distance of 1,662 miles. Obviously, this price will fluctuate lower or higher, depending on where you’re transporting your car, as well as how big your vehicle is. Where is the car is coming from? When do you want to have it shipped? How do you know who a bad company is? Knowing this begins with understanding what is happening behind the scenes. 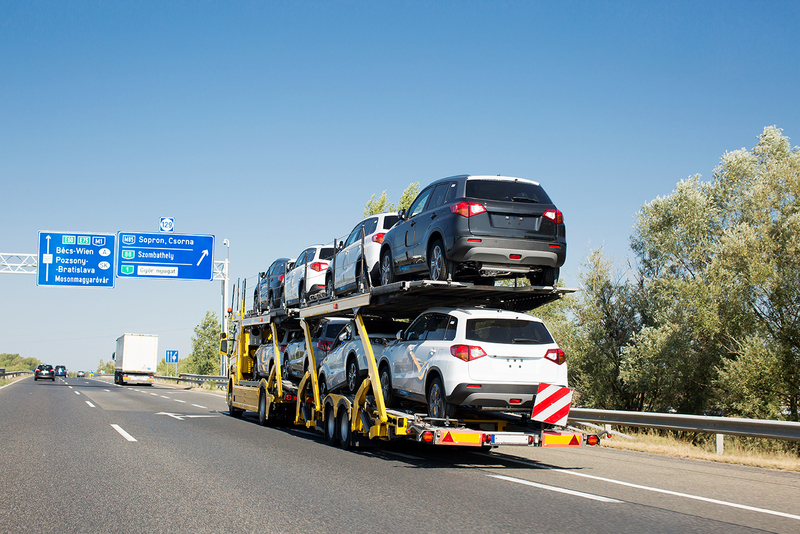 There are two types of car shipping services, and first-time shippers usually have no clue which they are (or how good they may be) until well after they ship their first car. What’s a “Broker” and what’s a “Carrier”? And why does it matter? Brokers are companies that don’t actually own the truck that ships your car. Almost all of the companies that you find online are brokers and don’t actually own the transportation. Their purpose is to find the carrier who will actually ship the car. This can sometimes be a necessary step because finding a carrier without the connections that brokers have can be extremely difficult. You generally want to avoid brokers who are not upfront that they themselves are not shipping your car! Brokers charge a set fee for their service and make an educated guess on what the rest of the transport will cost when they give you a quote. Whether or not they tell you they are a broker upfront depends on what kind of company you find. Carriers are the companies that own trucks and employ drivers. This is the company that will do the actual relocating of your vehicle. The reason brokers are necessary is due to most of these shipping companies being extremely small. It’s not uncommon for the owner of the company to be the driver and sole employee. These small companies don’t have websites and don’t do any marketing because they rely on brokers for their freight. If you are not already inside the industry, finding a company on your route and on your schedule would require hours of work. With the magic of the internet, it’s easier than ever to check who is and who isn’t legit. Before you request a quote from a company, check their reviews. Car shipping companies have many different sales tactics to trick you once they get your information. What’s the most common tactic to trick customers? After ten years of experience, I know it’s simply to promise impossibly low prices in order to get you to book right away. Do not simply request quotes from as many companies as you can. By giving away your info, you will run into very persistent sales people that will never stop calling you. Furthermore, there are some companies that look like transport companies but are actually what are known as “lead generators”. This means the information you put on their site is going to be sold to 10 or 15 different companies. Your phone will not stop ringing for days! 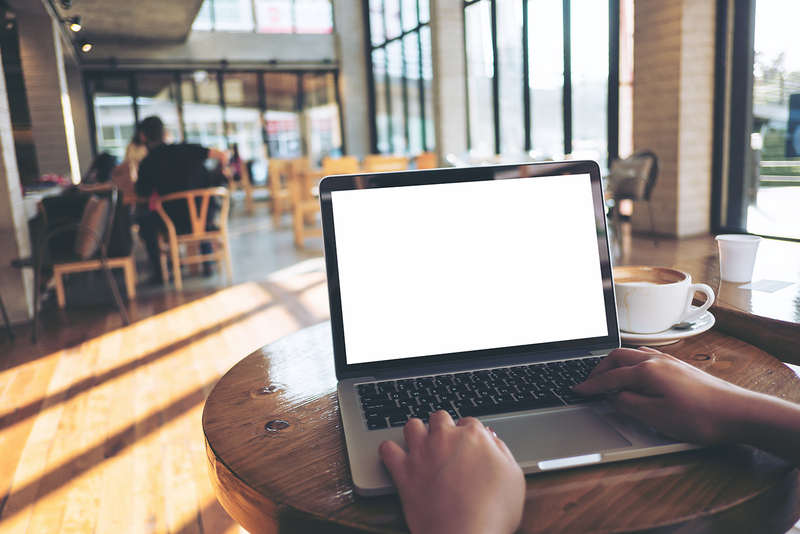 You want to get as many quotes as you can, but you need to make sure the company is a legitimate broker or carrier before you inquire. How? Check for and read verified reviews before requesting quotes. This will help you avoid bad websites. Did you get an extremely low quote? That’s a red flag. If you found a good broker, getting an easy to understand contract should be a breeze. But you still have to be careful (just like you should with every contract you sign!). Read through the contract very carefully. 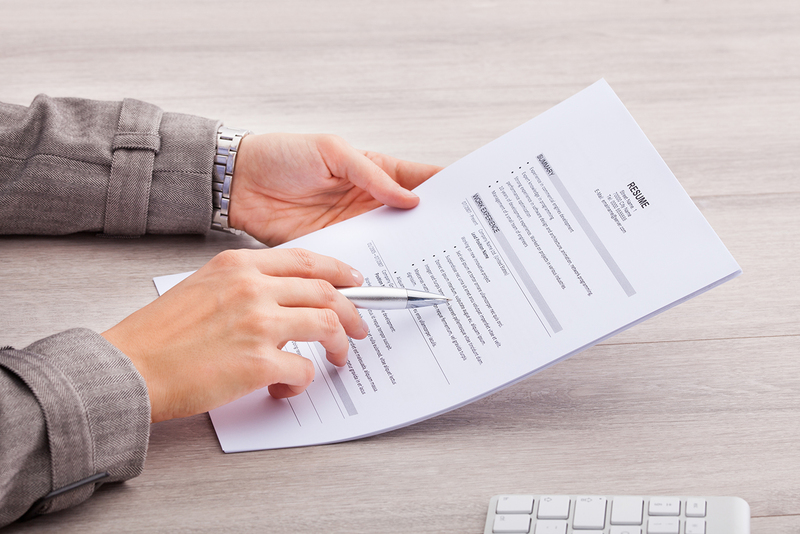 If your contract says anything – and it will be small – about the price “not being guaranteed”, this is a major red flag. I have heard plenty of stories from customers about how they signed a contract with a broker, only to be told at the last minute that the price is a $100 to $500 more “than expected”. Just imagine the moving truck has all of your things, then the broker calls and says they have a carrier but it is going to cost $150 more. You won’t really have a choice by that point. It is standard practice to get your car inspected by the shipping company, but first, you need to clean the car so that an accurate inspection can be done. If the car is dirty, the driver might miss something when they do the inspection on pick up, or you might miss something when the inspection is done on delivery. An accurate inspection is vital in case there is a problem. Do auto-shippers charge by weight? Yes. Lighten your car as much as possible. Auto shippers will charge you by the weight of your car, and bigger vehicles will cost more to ship. 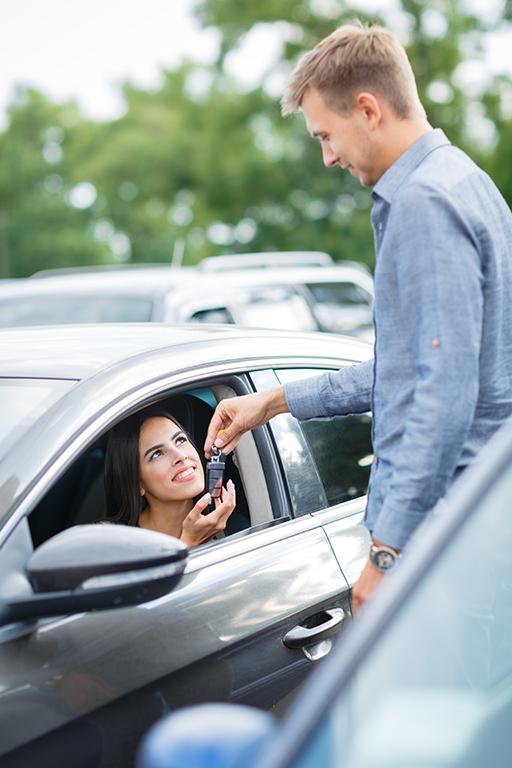 Most drivers allow 100 pounds or less for free. (Remember: the personal items you put in the car cannot be insured.) If you exceed 100 pounds, you could be charged extra for the added weight. For a totally packed small car, the driver will ask for around $200-$300. A totally packed large SUV or truck could be from $300-$500 extra, or the driver might even refuse the shipment. If you need to put things in the car, let your broker know ahead of time when you are booking so that they can arrange it with the carrier. Drivers also prefer you leave the car with a quarter tank of gas. That’s enough so that they don’t have to worry about it running out when moving it, but not so much that they haul additional weight for no reason. Now that you’ve found a good company, you’ve signed the contract, and you’ve readied your car, you need to tell the company the best place to have the car picked up. When will my car be available for pick up? If you are flying, think about which end you need the car more. Is it the city the car is being picked up in, or the city it is being dropped off at? Trust me, in my experience, you will definitely beat the trucker to your destination. Remember that all delivery dates are estimated. Moving trucks have one pick up and one drop off, so you can imagine that a moving truck estimate is much more accurate than auto transport trucks, who routinely have to deal with around 10 different pickups and drop-offs a day! Because of this fact, make sure that you have a backup plan on the day of pick up and drop off. If the car isn’t delivered when and where you need it, ask a friend that can hold onto the car for you, or maybe a neighbor. It’s not even unheard of for a hotel manager or car dealership to offer this as a service. When the truck comes to pick up the car, make sure the driver does an accurate inspection and that you get a copy of the inspection report on pick up. This ensures the state of your vehicle cannot be altered. The inspection report is the only thing that can support your claim if any damage occurs. The delivery driver does the inspection on pick up, you do the inspection on the delivery. Remember that if you sign the inspection report, you are releasing the driver and the company from all liability. That means if you notice something later, there is nothing you can do! In my experience, damage doesn’t happen often and the process for getting reimbursed is not difficult if you do everything right. Almost all damage during transport is extremely minor. Small scratches or a dent is the most common of these things. Most companies will prefer to handle the matter directly rather than have you go through their insurance company. The most important thing is that you do not sign the inspection report until you have received your reimbursement. Again, damage almost never happens in the first place, but you need to make sure you handle the paperwork properly if it does. Do I have to do anything else after the car is delivered? Hopefully, everything is done correctly and the process will be seamless. But if not, leave a review. If you were happy with the service it’s always nice to leave a review saying so. The best place online to do this is on transportreviews.com, which in my experience is the biggest and most sincere community for car transportation reviews online. By leaving an honest review, companies know what they are doing right and you’ll help the next person transporting their vehicle make a more informed decision. Similarly, if you weren’t happy with the service, let your broker know. Some things are out of the control of the broker and the driver, so be understanding if your car was a day late. Like I mentioned earlier, dates are always estimates in the auto transport industry. If however, you feel that your experience was poor, then it’s especially important to leave a review. This helps future customers and the companies that are doing good work out there. Max is the owner of MiG Auto Transport. He has been in the auto transport industry for over seven years. Originally from New York, he now lives in (sometimes) sunny Jacksonville, FL. He loves his wife, dog, cars and (sometimes) the Jacksonville Jaguars. Loading your truck is like getting ready for prom. You want everything to be perfect. Unloading, on the other hand, is kind of the same way; take everything off, drop it on the floor and go jump in the pool with your friends, right? Yes and no. Unloading a moving truck is definitely easier than loading one, but like jumping in the pool, there are good ways and bad ways to do it. 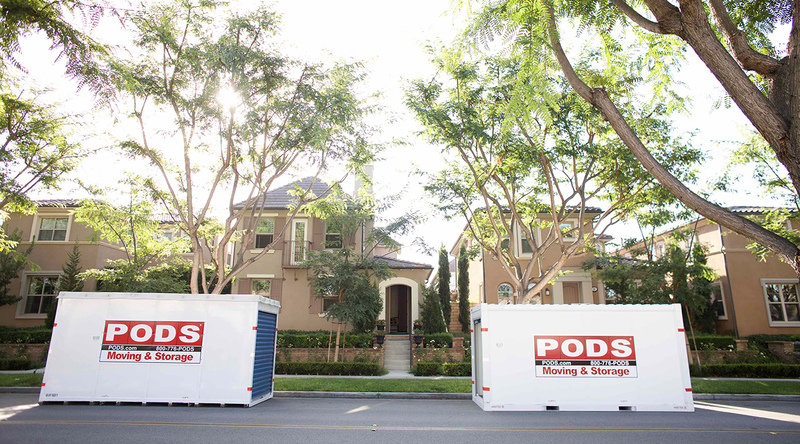 If you are renting a portable container like a PODS, you can expect it will be set on even ground. The same thing goes for a rental truck. This applies even if you park on a level surface. 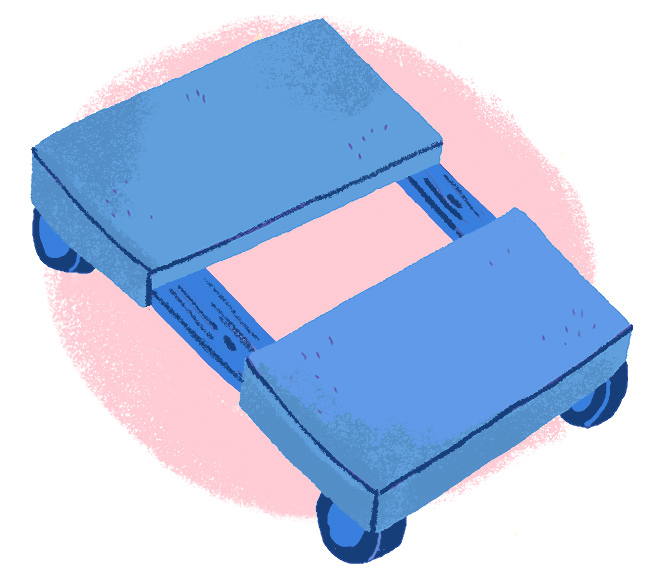 It also doesn’t hurt to put chocks – or rocks or blocks of wood – under one or more of the wheels. Your stuff will have shifted around in transit, and the possibility of something tumbling out onto the ground, or on you, is very real. If something is about to come tumbling out, you may feel and/or hear it pushing against the door as you open it. But not always. Keep your eyes open and have an extra set of hands ready. Rental trucks generally come equipped with a loading ramp that slides right out from under the rear door. Unlatching it, sliding it out and locking it in place is simple. So is hurting yourself if you aren’t careful. That ramp is heavy! And pulling it too hard can turn it into a battering ram with you being the one getting battered. Ease it out all the way and set it down on something not your toes. And remember to set those hooks at the top of the ramp securely in place! That’s right! Even if nothing looks about to topple over, you still want to take it easy when you begin unloading your stuff. This goes triple if you have a freight trailer! The pedal of the bicycle you so carefully placed on top of all those boxes might now be stuck in between two of those cartons, and pulling too hard trying to free your bike can send a whole stack of stuff cascading down on top of you. Remember, if your truck was packed to the gills, you won’t have much room back there for your feet. Take your time. Watch your step. Ease those first items off the truck, always aware of how close your Nikes are to the edge of that deck. 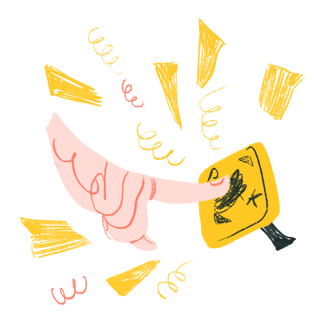 One misstep and there goes your stuff (and you). 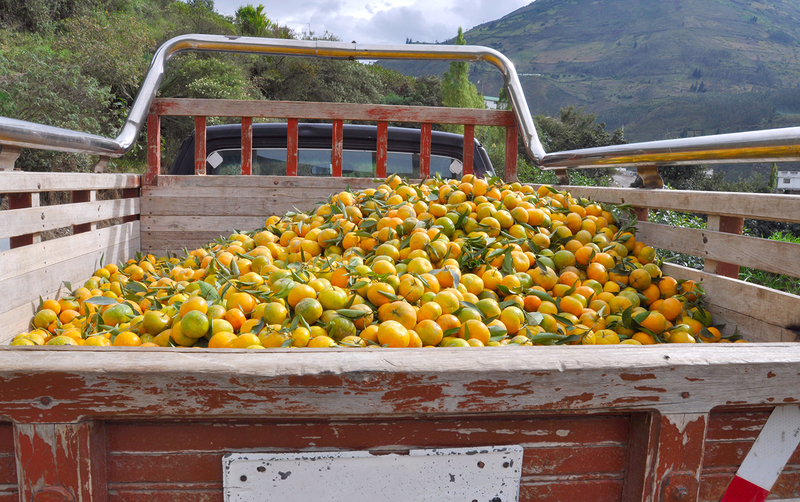 If you have someone (or a few people) helping you, assign one person to stay on the truck to break down the load and put everything at the edge of the deck where the others can grab it without having to climb into the truck. Not only does this save time, it also eliminates a ton of bending over. Working like this, it’s never long before the person on the truck gets ahead of the others. This is a good time for that person to nominate someone to help carry that sofa or dresser off the truck and into the house. In addition, jumping off the truck and helping get all the stuff they’ve set on the deck into the house is the obvious way to keep the process rolling. Tackling the unload all by yourself? Try working in a similar fashion. As you break down your load, position as many boxes and other items as possible along the edge of the deck. Then you’ll be able to make a bunch of trips back and forth without having to walk up and down that ramp every time, saving both your legs and your back. Naturally, the person on the truck will start getting ahead of the person carrying stuff to the staging area, who will in turn probably get ahead of the person running back and forth inside the house. Periodically jumping off the truck or stepping inside to help your buddy catch up keeps everyone moving – and quickens the process of emptying out that truck or portable container. Which, of course, leaves more time to enjoy the pool. 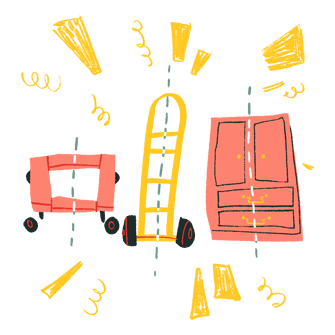 When you are unloading your moving truck, a hand truck (also known as a dolly) is your best non-human friend. Rolling heavy stuff means you don’t have to carry it. Rolling a stack of boxes means making one trip instead of three or four! The bigger your load and the heavier your stuff, the more you will thank yourself for having that hand truck around. It’s an essential item to rent of your moving truck doesn’t come with one, or if you don’t hire moving labor. Make sure, by the way, to use that hand truck correctly. You should always be higher than the dolly when rolling stuff down that ramp. If you are hand-trucking something large and/or heavy, have an extra set of hands at the lower end to keep that thing moving steadily—and slowly! Want to really learn how to use a dolly? Check out this post. It goes without saying that when you’re unloading major appliances and large pieces of furniture – or anything for that matter – you want to be doubly certain neither your feet nor the wheels of your hand truck miss that ramp. But you also want your hand truck to hit the ramp squarely; if one wheel starts going downhill before the other your hand truck will start to tip to one side. Your buddy on the bottom end will naturally try to steady it, which can send one of his feet off the side of the ramp, and things will just keep going downhill from there. 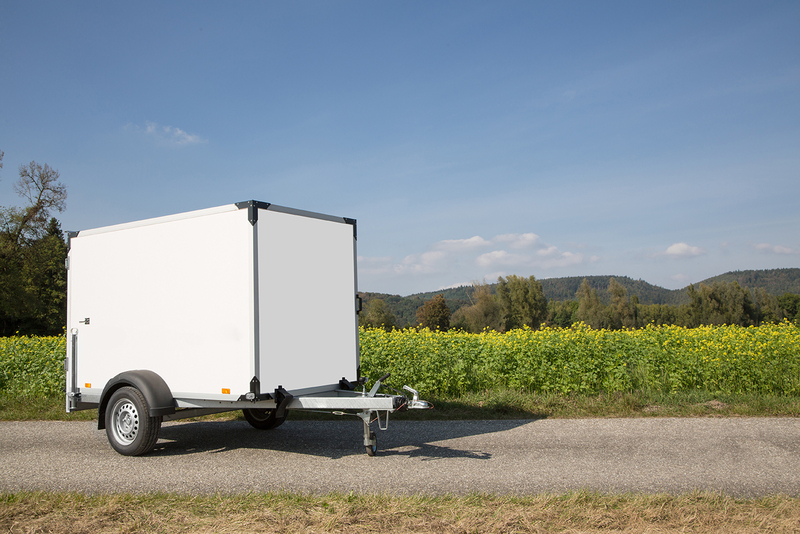 Whether you are rolling or carrying that big heavy appliance or piece of furniture, you want to get centered on the back of the truck before you head for that ramp. Again, when using a dolly, those wheels go down before you do. If you and a buddy are carrying that item, whoever is holding the bottom end needs to travel down first. In either case, the person on the lower end is responsible for maintaining a straight line of forward progress. That’s a whole other thing, so make sure to read our unpacking guide too! 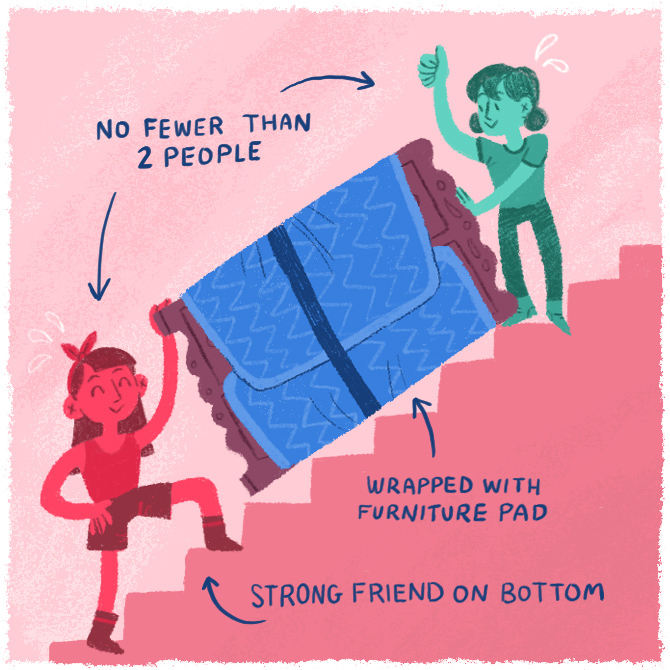 Protip: If you have to walk up a slope or up any stairs, it’s good practice to turn yourselves around so the person holding the top of that big bulky piece is again in a higher position. In other words, the person on bottom pushes while the person on top does their best to avoid banging into the walls and tripping up the steps. And if all else fails (or you realize you have more stuff than you thought you did after loading your truck), do yourself a favor and double-check our movers’ prices for unloading trucks. I’ve saved plenty of people’s moving day who thought to check, even last second. Every Major Moving Report of 2017 Analyzed: Where Is Everybody Going? Migration reports are out in full force, including the famous United Van Lines yearly report. But while United handles more moves annually than any other mover network in the country, their numbers are not definitive across the industry board. North American, Atlas and Allied all see slightly – and in some cases, wildly – different results in their migration study results. Not a surprise, because as a Full Service move provider, United handles a somewhat different clientele compared to companies like ABF, U-Haul and PODS – companies whose numbers might look a lot different. Then there’s that little thing called the Census. In 2015 they came in at third on the inbound rankings. In 2016 they inched their way up to number two. Now, this tiny state known mainly for skiing and maple syrup has captured the coveted top inbound spot on United’s 2017 National Movers Study. Yes, the champagne is indeed flowing like syrup in Stowe, Killington and Montpelier as Vermont looks back on a year that saw a whopping 68% of their interstate moves coming in. According to United’s survey, “family” was the most common reason respondents gave for relocating to the Green Mountain State. Retirement, lifestyle and job also figured fairly evenly into the equation. On the other hand, a full 75% of people moving out of state gave employment as their reason. This helps explain why half of all outbounders fell into the Under-35 age category – and another 25% were between 35 and 45 – while 40% of those moving into the state were 65 or older. Those mountains may be green, but with those unemployment numbers, it looks like the valleys are starting to turn gray. This past year saw some familiar names on United’s Top Ten Inbound States list. Oregon, Nevada and North Carolina are all there, as they have been every year since 2011. Washington, Idaho, South Dakota, South Carolina and Arizona are also back after making 2016’s inbound list. Newcomers include Alabama and Colorado. Meanwhile, Florida has dropped off the inbound list after a strong three-year run. This past year’s top inbound states are also fairly spread out around the country. The same cannot be said about United’s outbound states. 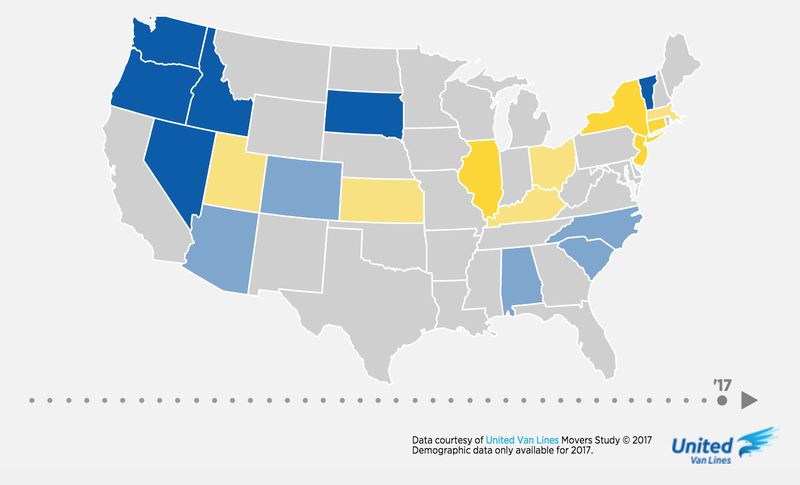 As with the previous few years, the major exodus seems to be coming out of the Northeast and the Midwest, with Utah adding a little “outbound yellow” to the otherwise blue western region on United’s interactive migration map. 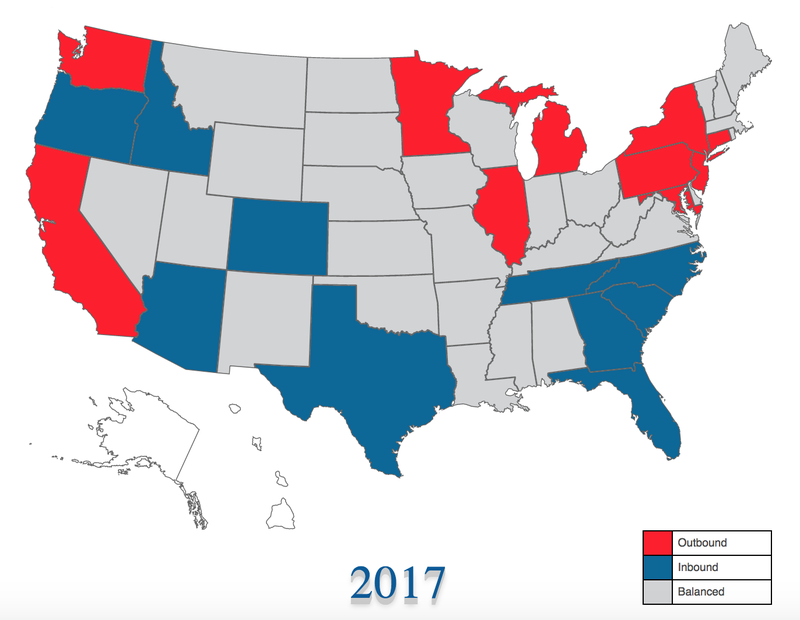 Perennial outbound states New York, New Jersey, Connecticut and Illinois have been the most unfortunate ones; we’d have to go back to 2010 to see any of them as balanced. (New York and Connecticut were both spared the shame that year). Like United, North American has Illinois, New Jersey and Connecticut at the top of their outbound list (with New York a notable #8). But the rest of their top outbounders – California, Michigan, Pennsylvania, Minnesota and Maryland (#4-8 on the map) aren’t even on United’s radar. Interestingly, North American’s #10 outbounder is Washington, which ranks #6 on United’s inbound list. This may explain why United’s 2017 champ Vermont and #5 South Dakota (United’s #1 in 2016 by the way) aren’t anywhere on North American’s Top Ten. Atlas Van Lines offers some relative surprises too. Idaho, Washington and Nevada as their top three inbounders may not raise any eyebrows. But Alaska, Maine and New Hampshire at #5, #6 and #10? Oregon is a familiar name, but seeing them at #8 seems in contrast to their recent United Van Lines inbound championships. Atlas’s top outbounder, meanwhile, is Illinois (same as both United and North American – those Fighting Illini have a real stranglehold on that top spot!). And their #2, West Virginia, was a strong outbounder for United for six years straight before balancing out in 2017. But Nebraska at #3? Nebraska has been balanced for United since 2001! And #4 outbounder South Dakota has been an inbound darling for United the past three years. Rounding out the Atlas top outbound list are Hawaii, Indiana, Delaware and Louisiana, all of them somewhat surprising since three of them have spent the last ten years on United’s “balanced” register. Only Indiana has managed to make a blip on United’s outbound radar in that time frame. 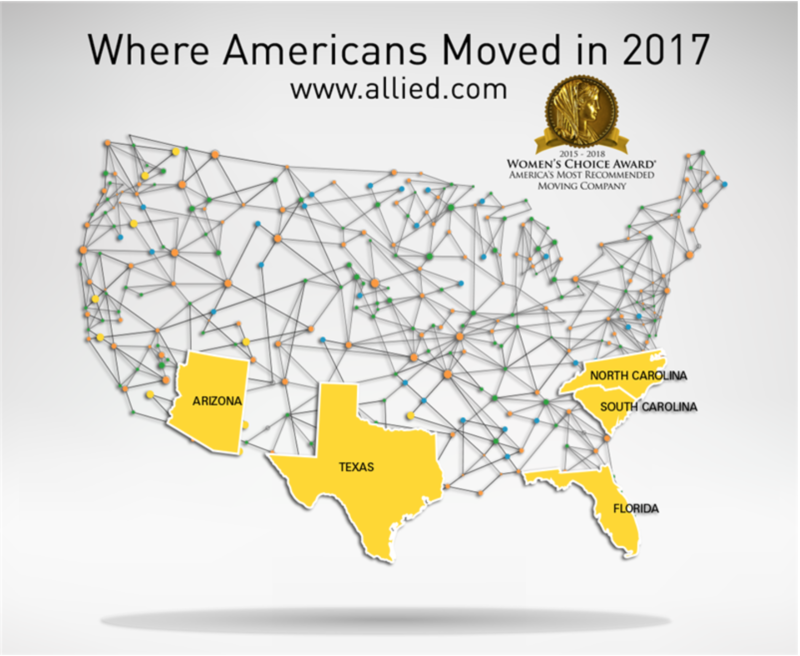 Based on this limited report, we’re able to come to at least one solid conclusion: Allied’s drivers love moving people south even more than North American’s do. Do U-Haul’s numbers reflect what the van lines suggest are moving trends? Texas tops U-Haul’s 2017 Growth States list. This shouldn’t come as a huge surprise, as Texas has fared well recently in the inbound-outbound game. In 2017 their inbound percentages with United, North American and Atlas were 54, 53 and 53, while Allied put Texas down as their fifth biggest inbound state. Oddly, Texas won U-Haul’s Growth State crown by bringing in – get this – a whopping 50.3% of all one-way truck rental traffic crossing Texas’s borders. That’s right. Fifty. Point. Three. This hardly lends a whole lot more understanding to the migration trends we’re trying to dissect. But here we are, so let’s keep moving. U-Haul rounds out its top five Growth States with Florida, Arkansas, South Carolina and Tennessee. Yes, Arkansas – which has been balanced on United’s report 37 of the last 40 years. Then again, Arkansas remained balanced in 2017 on United’s ledger with a 54% outbound rate, so that they are U-Haul’s #3 Growth State is rather surprising no matter how minuscule their positive U-Haul balance might have been. And who comes in at #8 on U-Haul’s list? That big loser with United and North American (but not with Atlas), Connecticut. On the flip side, U-Haul has Colorado at #9 – exactly where United and North American have them. Yes, the Bureau has all the moving numbers we could possibly want. So many, in fact, that it could take until next January to weed through them all. But thanks to Business Insider we don’t have to. In this piece with the strangely long title: While the Bureau considers “a variety of components” in determining what’s happening among the more than 325 million people who make up the US population, Business Insider brings us what we need: domestic migration. And in this, the winner is Idaho, with a net domestic migration gain of 14.6 people per 1,000 residents. In second place comes Nevada, with South Carolina, Oregon and Arizona rounding out the top five. The second half of the big ten winners are Washington, Montana, Florida, Colorado and North Carolina. These results actually mirror the van lines’ findings to a striking degree. Only Arizona, Montana and Florida don’t show up in United’s top ten. Seven of the Census top ten are also on North American’s top ten. Unbelievably, Colorado is #9 on all three lists. As for the Net Domestic Migration losers? Yes, Illinois is up there, but at #5, maybe this is the survey they should be talking about in Chicago. The big loser in the 2017 migration tournament is Wyoming, a surprise since the Equality State doesn’t show up on any van line outbound lists – or inbound for that matter. United had them at 53% inbound for 2017. North American had them at 54% in. Only Atlas has them as outbound – based on a grand total of 330 moves. The Bureau’s next three biggest net migration losers are Alaska, New York and Hawaii. Alaska and Hawaii, neither of which show up anywhere for United or North American, are Atlas’s #5 inbound and #5 outbound, respectively. 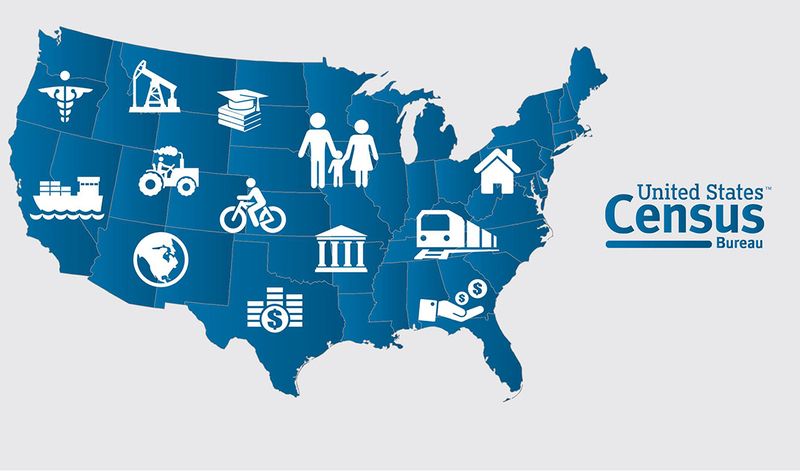 North Dakota, New Jersey, Connecticut, Louisiana and West Virginia complete the Bureau’s top ten. Again, while there are outbound wild cards, we still see some consistency between the Bureau and the van lines. Atlas and the Bureau actually have seven migration losers in common between their top tens. 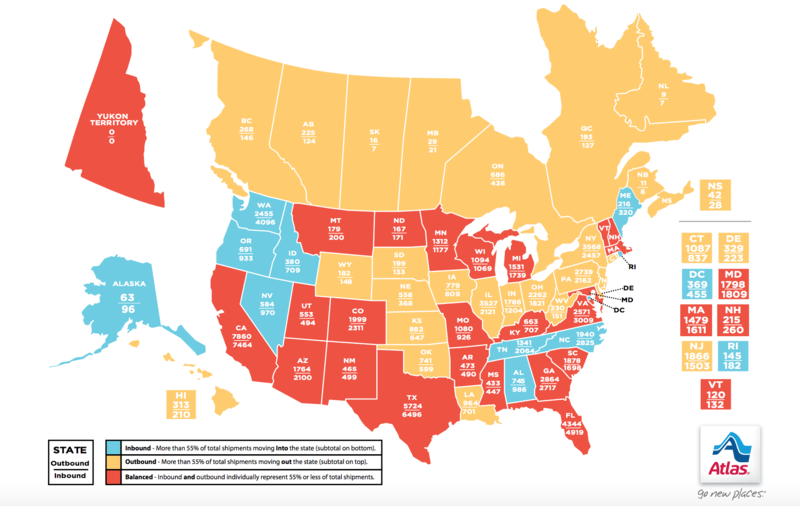 Looking at the US Census Bureau’s Net Domestic Migration map we can clearly see the winners clustered in the south and west with the losers dominating the northeast and midwest. Remember, the numbers put together by each of the van lines represent the migration trends among the customers they’ve served. Van lines count moves, the Bureau counts people. This may not account for the reason United’s inbound champion Vermont is somehow a net loser according to the Census Bureau’s numbers, but it does suggest that, despite the discrepancies, the van lines and the Census Bureau can give a decent overall on what is going on out there. But in the cases where data remains too contradictory to be meaningful, evaluating regions rather than individual states might give us a slightly more reliable picture of the migration trends playing out across the US. At the end of the day, we are only looking at a mere slice of the American migratory pie. We need another, more encompassing way to look at where America is moving to and from. 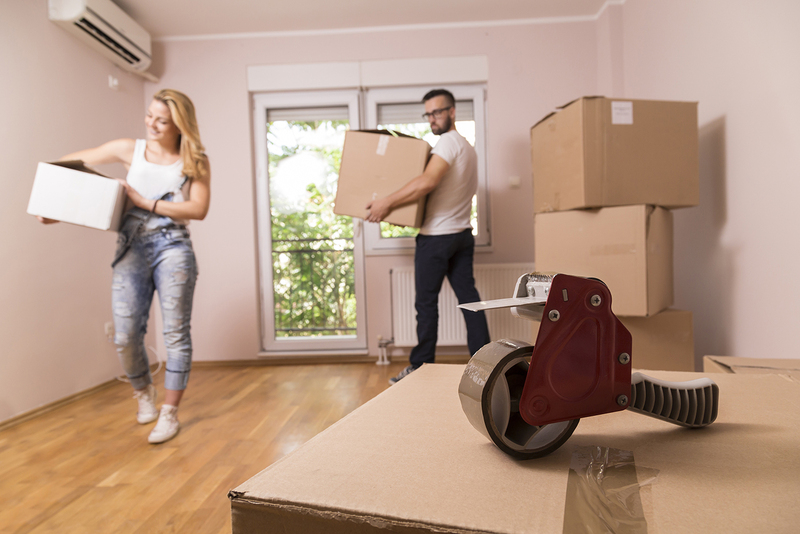 DIY Moves and Hybrid Moves (besides U-Haul), which by far and away are the more common ways to move, are sorely misrepresented. 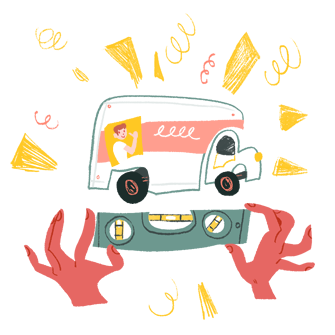 When you move, do you routinely call up $2,000+ movers? Have you ever saved money by having your friends move you? What are these Full Service reports actually reflecting? That’s something to keep in mind when the local news sounds off on “moving trends” based off a single Full Service Moving company’s report. My wife thought I was nuts. It was only the end of February, but I was already hauling in piles of used boxes so I could start planning my move. “We’re not moving until the end of June!” she cried, visions in her head of sleeping on the floor between stacks of cardboard boxes, I guess. I told her I knew what I was doing and disappeared into the basement. And in fact, I did. There are plenty of understandable reasons not to start planning your move four months ahead of time. But those reasons don’t seem so smart when you suddenly realize you’re moving in three days. If you’re looking to move sometime between Memorial Day and Labor Day (along with about 20 million other people) you have even more reason to get a jump-start on things. These are the most practical reasons why. There is one major reason people end up with crappy movers – or in some cases end up getting scammed by people posing as movers: They didn’t do their homework before hiring them. Make sure it lines up with the costs reported by other Americans. And true, you may not know several months in advance exactly what day you’ll be moving. But don’t wait until a week before you’ve written “Moving!” on your calendar to start doing your homework. Get on it! 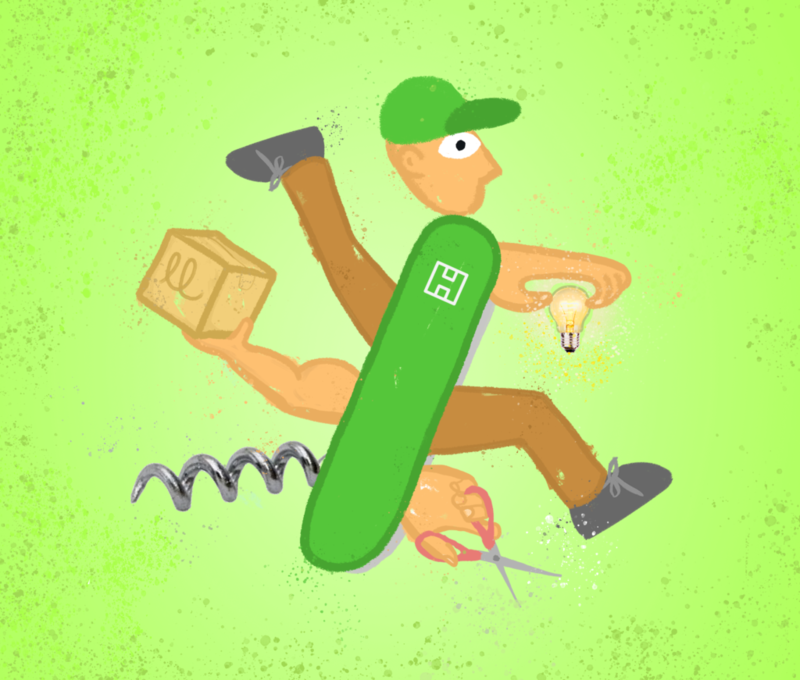 As the summer approaches, moving company sales representatives are just as busy as movers. Sometimes they’re even busier. But having a grasp of what you need ahead of time will prevent from your two-hour move turning into a six-hour one. Conventional wisdom says you should get at least three in-home estimates if you want an estimate you can be fairly confident in. If you wanted to be absolutely thorough by price and quality, you not only need to find three solid moving companies, you need to find times that work for their three sales reps and for you. The closer you are to move day, the busier you will be. The closer it is to summer the busier they will be. The good thing is, you don’t have to know when you’re moving to get your estimate. You do, however, have to know what you will be moving. Of course, you can make some changes down the road if need be. Just be sure to communicate these changes ahead of time, not on move day! Protip: Your sales rep might notice things you wouldn’t even think about, like the fact that the big office desk you assembled in the spare room isn’t going to fit out the door, or that your massive fish tank will probably need to be crated. Having the luxury of time to get these unexpected extras taken care of may prove to be a lifesaver. If you want to be efficient, you don’t want a bunch of perplexed strangers showing up on moving day. While you won’t have much to worry about if you hire movers through HireAHelper (after 70,000 5-star reviews, we can say things like that), getting to know each other before the actual move day creates a good vibe for both parties. More than this, having time to ask questions and bring up concerns helps your movers prepare for the job ahead. By the same token, you can expect your movers to be as busy as you are in the lead-up to your move. Say hello, let them know what you need, let them know you appreciate it, and then step back and let them do their thing. We can’t absolutely guarantee that you’ll end up paying more if you hire your movers in the middle of May rather than the middle of March, but we are dead-certain you won’t save yourself any money by waiting until the last minute to book your movers. Unless of course the only movers left available are sketchy guys with a string of bad reviews. As move day approaches you’ll be going absolutely nuts tackling a thousand last-minute tasks, from canceling utilities to meeting with your landlord/realtor, to cleaning your apartment well enough to get your deposit back to getting all that non-perishable food to the soup kitchen. It will be in these final frenzied hours and days that you’ll be glad you got a three-month head start. That’s simply the nature of the beast. We do guarantee, by the way, that once you start packing, you’ll realize that you have about three times as much stuff as you thought and it’s going to take you quadruple the time. Yep, if you’re like me, you’ll likely be so tired that you’ll have no problem sleeping on the floor between those stacks of cardboard boxes. But just to be safe, pack your bed last. The drive to develop automated vehicles, “AV” for short, has gone into high gear this past year. From the US to Europe to Asia, AV technology is advancing by leaps and bounds. But in one place the road to automation has taken an interesting turn. But in Australia engineers seem to be stumped by one of their own: the kangaroo. Our friends over at Marketplace explain that “Kangaroos are much trickier – faster and more shape-shifting – than other animals that wander onto the road.” Deer and moose are big and generally move slowly, adds University of Washington computer scientist Pedro Domingos, making them easy for a vehicle’s vision system to recognize them as such. Of all animal-related accidents in Australia, eighty percent involve kangaroos. 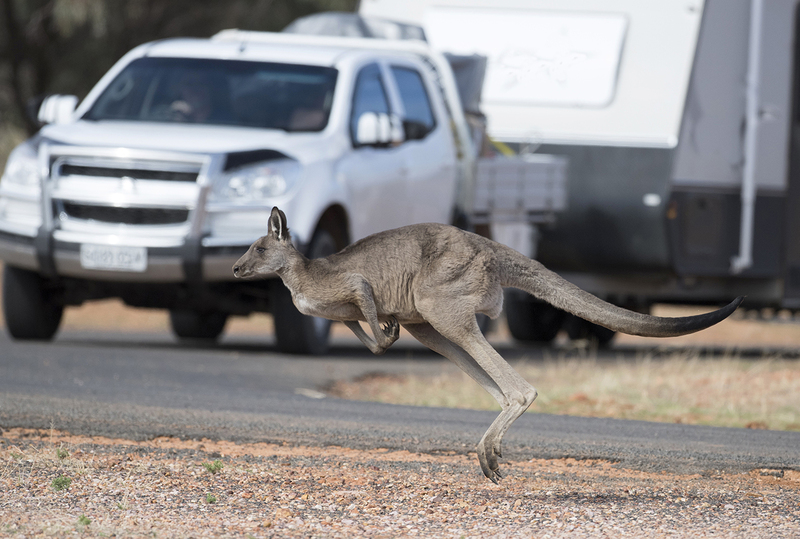 Kangaroo-recognition, then, is a critical aspect of automated vehicle technology. That’s the challenge in Australia, anyway. Here in the States, our engineers are scratching their heads wondering how to deal with all the direction-changing squirrels in the road. Maybe our engineering issues will be easier to overcome.